In an increasingly complex world, readers need to remind themselves of what is most precious. 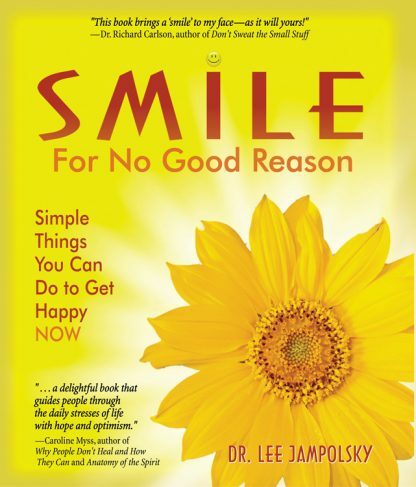 Smile for No Good Reason offers simple, practical ways to be happy by approaching life with a different attitude. Dr. Lee Jampolsky, a psychologist, is a widely published author with books in many languages, touching lives around the globe. He lectures and conducts workshops internationally in the fields of health, business, education, and psychology. Dr. Jampolsky has founded highly acclaimed programs in clinical psychology and chemical dependency, served on the medical staff and as a consultant for leading hospitals, and has been on the faculty of three graduate schools of professional psychology. His writing and teaching contain a deep understanding of the human condition and a thoroughly compassionate set of solutions. He lives in Carmel Valley, California, where he spends time with his kids, friends, and dogs, and plays and smiles as much as possible.